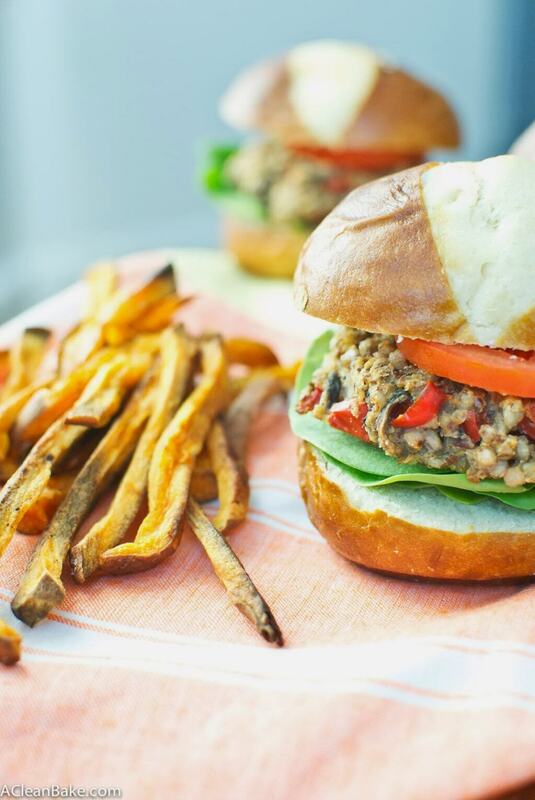 Pop quiz: what goes better with sweet potato fries than a burger? Why? It’s just a rule of the universe. Duh. 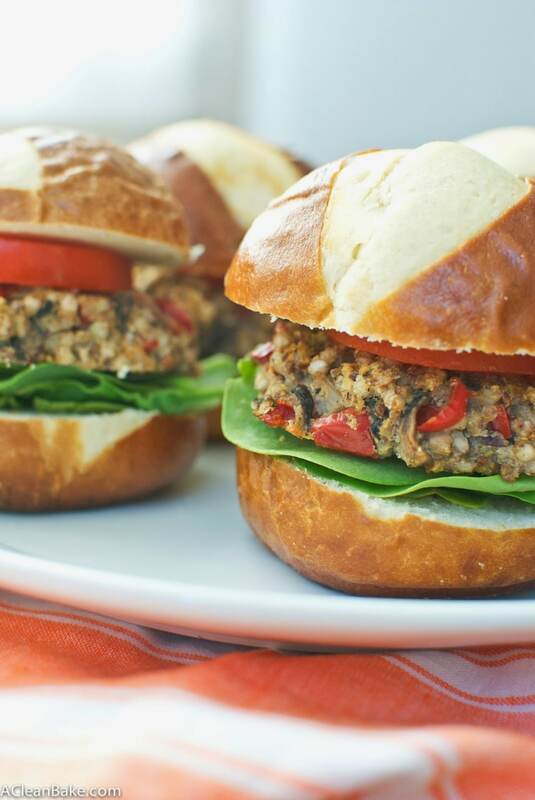 Veggie sliders are inarguably better than beef sliders, though, especially when you’re someone who hates beef and likes arguing (me), or someone who doesn’t like meat but whose stomach can’t handle, um, anything from the grain or legume families (also me). Because of my sensitivity to legumes, I try to limit my intake to the good stuff like bean-based brownies and whoopie pies. 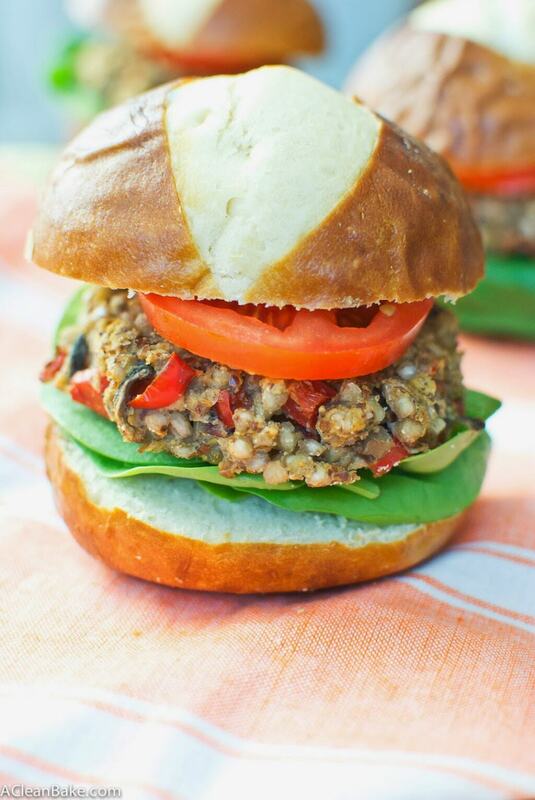 Since traditional lentil/chickpea/rice concoctions are out, that makes veggie-burger-ing pretty tricky. Thank goodness for the magical seed of the buckwheat plant. Just…don’t look for a bag of “magical seed of the buckwheat plant”. You might end up with weed. You want buckwheat groats. But anyway. These burgers are delicious thanks to the sauteed mixture of finely diced onion, baby bella mushrooms and red pepper that makes up the base. You can absolutely pre-make the sauteed veggies and boiled buckwheat, refrigerate overnight or even for a couple of days, and then mix with the egg, spices, etc, when you’re ready to bake them. And luckily, since it’s #BurgerWeek, I had a great excuse to make a few (billion). 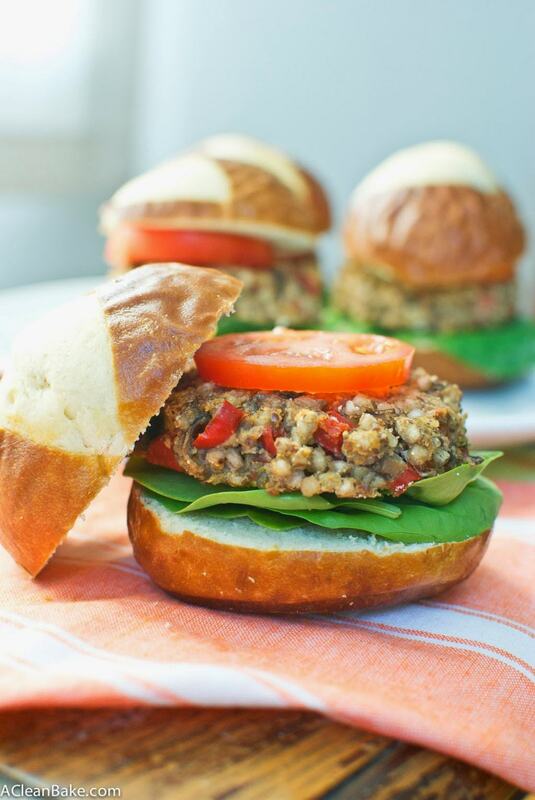 Not only are these burgers a great make-ahead dish, but, once baked, they keep very well in the fridge or freezer and taste wonderful after being seared in a hot pan with some olive oil, or (carefully) on the grill. I say carefully because they are a little delicate. You definitely need to bake them before you grill them…sorry. But that’s a good thing, right? Their delicacy is proof that these are wholesome, homemade little gems. 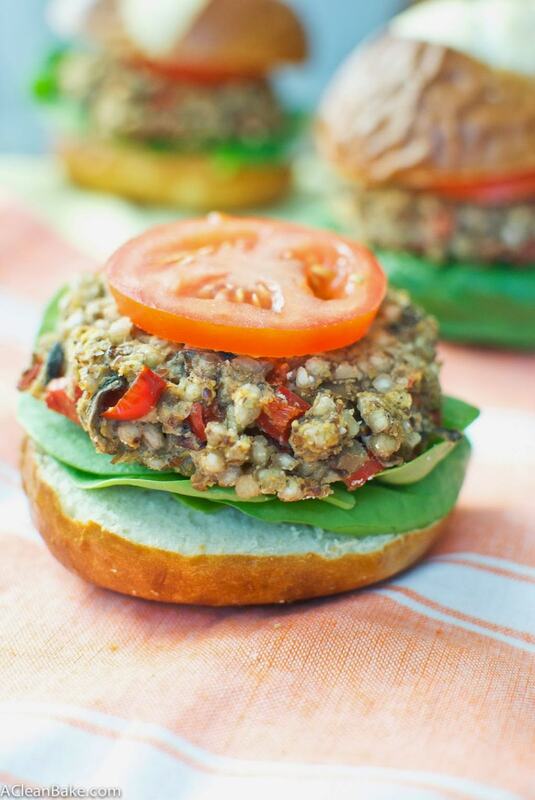 No factory-made hockey-puck-ish veggie burgers here. 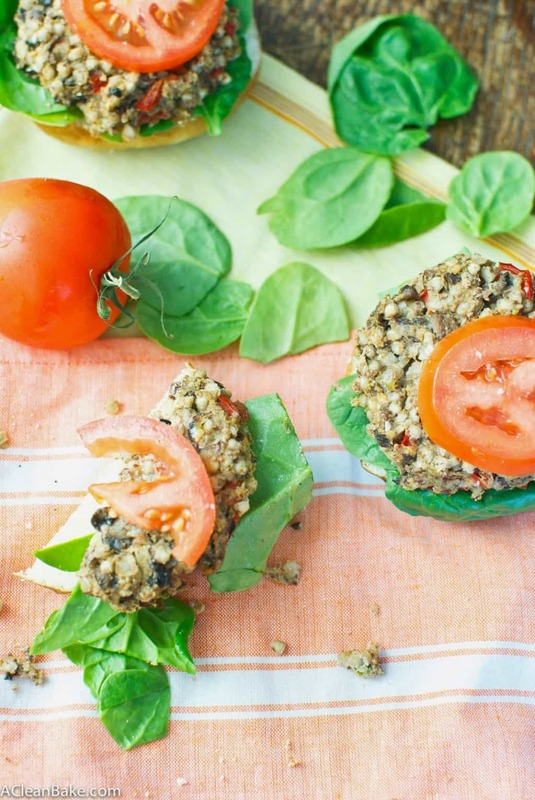 Just moist, flavorful, nutrient-rich sliders that are completely vegetarian, nearly vegan (replace the egg with flax egg and you’re in business), paleo, and allergen-free. Let’s fire up the grill! 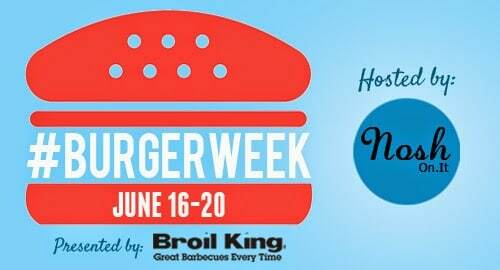 PS: Don’t forget to scroll down past the recipe for a full list of today’s #BurgerWeek posts, plus an incredibly generous giveaway courtesy of NoshOn.It and Broil King! Bring 1 cup of water to a boil. Add buckwheat groats and cook, stirring regularly, until thick and gooey. The water will not be fully absorbed, but will turn into a sort of starchy slurry. Don’t worry, the liquid will get absorbed as it cools. Allow the groats to cool completely, uncovered, until they reach room temperature. Heat about 2 Tablespoons of olive oil in a skillet and add the onions. Sautee for a couple of minutes before adding the mushrooms, red pepper, salt and pepper. Cook, stirring gently, until veggies are soft, and remove from heat to cool slightly. In a mixing bowl, combine the buckwheat, veggies, thyme, egg, flax, coconut flour, paprika, and garlic powder. Mix thoroughly to combine. Don’t be afraid to use your hands if necessary! Preheat the oven to 350F and cover a baking sheet or dish with a nonstick pad or parchment paper. Use an ice cream scoop to portion the batter into about 8 small balls, arranged evenly on the prepared baking sheet. 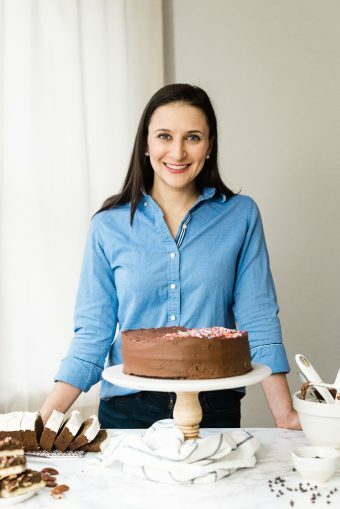 (You can make fewer, larger portions, but you’ll have to increase the baking time accordingly.) Press down gently to flatten into a thick patty. Bake for 18-22 minutes until edges are slightly golden. Let the patties cool on the baking sheet. They will firm up as they cool. Serve immediately, or store in an airtight container in the refrigerator for up to 5 days, or in the freezer for 3 months. Thanks to NoshOn.It for hosting this fun week and if you’d like to see an amazing array of mouth watering burgers (who can say no to that? ), check out the rest of today’s #BurgerWeek post from some of my favorite bloggers. Pardon me while I go fangirl a little bit. Oh, and one more thing: a giveaway! 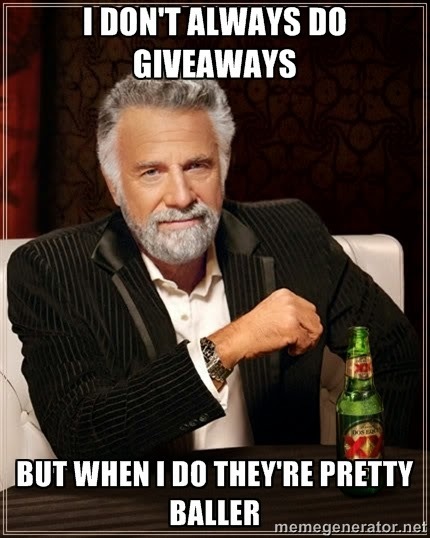 The Dos Equis guy speaks the truth. Case and point: today you can enter to win a grill. That’s right, an entire grill. Read on to learn more….